Take a look at this Mail Art Card I made a few years ago. 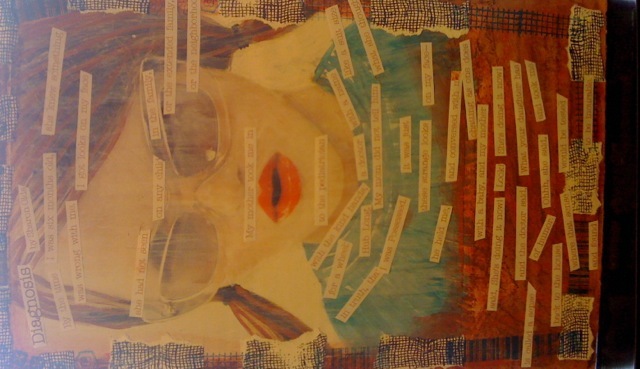 I cut out the words from a poem that wasn’t working for me, and using artist gesso paint, I applied them to a picture of a girl from a magazine — and turned it into one of my favorite art pieces. 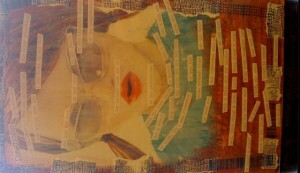 As an art piece, I think it works because individual phrases and words stick out as you look at the total image. The girl is stunning, with great attitude that illuminates from her face, and I love how the words from the poem match her glow. The poem never came together for me, but it now exists out there in the world as another layer on a Mail Art Card that one of my friends (can’t remember who!) received in his or her mailbox. I am not aware of what my friend did with the card — maybe it was propped up on a bookshelf to enjoy, or perhaps it sits in a drawer — it might have even ended up in a wastebasket. But here’s the thing: the outcome doesn’t matter. I let go of caring how something is going to turn out, and just enjoy the work — from the process of writing a poem, putting paint and paper and words on the cardboard piece — and play with it. For me, creativity and getting unstuck works better when I let go of perfectionism.